United States politician (Democratic Party). 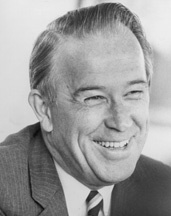 Congressman (1941-53) and Senator (1953-83) for Washington. Unsuccessful candidate for the Democratic presidential nomination in 1972 and 1976. Nicknamed "Scoop" by his sister as a child.